* The initial headlines on Friday called it a “U-Verse glitch,” but we now know that the presidential-level (“EAN”) alert message that made its way through part of the national Emergency Alert System had nothing to do with AT&T’s TV service in particular. Instead, it was the result of a nationally syndicated morning show (Premiere’s Nashville-based Bobby Bones) playing an audio clip of the national EAS test that happened three years ago this autumn. Will Bones lose his show over this? No, and he shouldn’t. While a FEMA alert to the engineering community on Friday afternoon urged, among other bullet points, to “socialize the implications of including EAS tones in the broadcast (§11.45 “Prohibition of false or deceptive EAS transmissions”) among the content providers and program directors,” we’d argue that there are deeper underlying flaws in the way the EAS system is designed – and until those are addressed and fixed, incidents like this one will keep happening. A bit of background for those of you on the programming or management side: as the successor to the old Emergency Broadcasting System, EAS was designed, at least in part, as an in-band system. 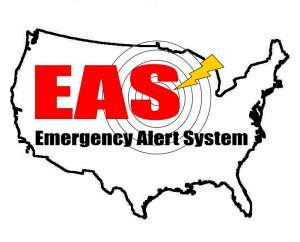 Under each state’s EAS plan, every station is assigned at least two other stations to monitor, and an EAS receiver is constantly listening to the incoming audio from those stations. Anything that’s transmitted as program audio on those stations can potentially trigger EAS receivers at stations downstream – and at cable systems that monitor for EAS activations, too. That’s what happened here: a piece of audio that was never meant to do anything other than illustrate the host’s rant (Bones was unhappy that a different EAS activation had interrupted him while watching a World Series game the previous night) ended up triggering a daisy chain of stations and cable systems down the line, entirely by accident, simply because the audio included a data burst that carried the “EAN” code from almost three years earlier. Yes, by all means there should be better education in the programming community that you simply do not play EAS audio over the air, ever. It’s a lesson Bones and his staff are learning now, and we’d bet the word is getting out pretty widely throughout iHeart and other big broadcast groups, too. But this is hardly the first time an errant bit of EAS audio has caused problems. We’ve had incidents in recent years in which EAS data bursts have been included in movie trailers and even public service announcements. With millions of hours of audio content being created every week all over the country, we’ll have more such incidents in the future, too. Doesn’t it make sense to lock the system down at the other end, too? If EAS must include in-band data signaling, those audio bursts of data shouldn’t be able to reach the transmitter from any source other than the station’s own EAS encoder. Somewhere out there, a clever EAS equipment provider out to be able to design a box that can stop the audio of EAS data bursts from getting down the audio chain to the transmitter and causing this sort of chaos…right? And as the next generation of EAS is developed, it’s probably time to break completely from the entire idea of in-band audio. That 2011 national test that Bones accidentally aired demonstrated that daisy-chaining audio from station to station doesn’t work well, even ignoring the telephone-link feedback problem that messed up the audio of the test in the first place. We have the capability to securely deliver audio and data directly to individual stations and to cable headends via networks that are at least as hardened as our broadcast system. Why are we still depending on delivering that audio and data over the same programming stream that brings us Bobby Bones in the Morning? Read this week’s entire NorthEast Radio Watch column here! But how, exactly, should a system designed to reliably disseminate emergency information to ALL over-the-air (and cable TV) broadcasters? Over the internet? Please…internet service is often the first thing that dies during a disaster. Either the networks get swamped from panicked citizens searching for info, or the power goes out at some crucial link and connectivity disappears. Or a tree falls on the wrong telephone pole and, oops, it goes down. Over cellphone networks? All the problems of internet made worse by less redundancy in cell facilities. Over satellite? Potentially very effective but also quite expensive…both to install satellite downlinks at every single station and to MAINTAIN those downlinks. Not to mention the costs of rent time on the satellite for something so infrequently used. And the problems satellite downlinks have during inclement weather. Rely on the NOAA Weather Radio network? That’s not a bad idea, although I don’t think you could rely on it exclusively. Esp. since it’s not widely known how much/little redundancy is built into their systems. But it’s not a bad idea to at least consider making NWS monitoring mandatory, perhaps with some additional resources to beef up the infrastructure accordingly. Over public radio outlets? That’s another idea that’s not bad. An awful lot of the country has signal coverage by NPR-affiliated radio stations (presumably PBS coverage is pretty good, too), and almost all of them have existing satellite downlinks. And there’s existing infrastructure in place; NPR/PRSS already sends weekly RWT’s over the Squawk Channel on the satellite. Plus these stations are used to working with top-level mandates and government grants. I could see modifying CPB funding to require participation in a well-organized EAS system and then modifying the monitoring schema to rely more heavily on NWS and NPR/PBS. But you can’t do it in a vacuum. While MOST public radio stations are probably better-equipped than their commercial brethren to handle EAS distribution, not all of them are. And this idea doesn’t really change the fundamental problems with daisy-chain distribution. Probably a bigger question needs to be asked: in a world of 24/7 cable news (and the aftereffects of the never-ending news cycle), what purpose does EAS serve? Basically, I don’t see it being useful except for alerting a huge number of people within a VERY short timeframe…less than 30 minutes. Longer than that and regular news outlets will start picking it up AND the public has been trained to go to those news outlets, so alerting is no longer necessary once they pick it up. That reduces the scope of operations quite substantially. Mostly to certain weather alerts (tornadoes, mostly), and major disasters that start small but get big quickly (nuclear power plant emergencies, for example). Really the need for the ability for the President to “address the nation” via EAS is almost nil. There’s really only one event that’d have such a super-regional or national impact, and require maximum speed to distribute the information: incoming ICBM nukes. Whether intentional or accidental, those missiles start hitting targets within 20 to 40 minutes of launch, so speed is critical. Minutes can matter if people can make it into shelters before detonation. Ironically, the daisy-chain nature of EAS today means it would largely fail miserably at distributing information within that narrow a time window. I wonder if the military has a communications system that could be piggybacked for something like EAS. The ELF and VLF transmission systems for submarines come to mind. That would make a lot of sense for fulfulling “the big one” rapid-deployment of information to broadcasters. Augment that with a robust NWS/NPR/PBS method for regional & local emergency information…AND remove the “option” to participate (come up with a system and make it mandatory for all) and you’d have a reasonably robust system. One thing I forgot: the Iridium satellite telephone system. Perhaps, with gov’t assistance (they already have a huge number of DoD users), it could be a more practical satellite distribution system. Float the company a big check from Uncle Sam and they give free satphones & service to every broadcaster. Not sure how well the phones work indoors, though. I know some of the phones can be used with external antennas so maybe that’s the way to do it. Beats me how well they work in lousy weather, though. EAS transmissions could possibly be piggybacked on to network broadcast transmissions like the way they current send visual updates to stand by for Special Reports, timings, etc. The original EAN / EAS Test of 11/9/2011 proved how failure was built in the system test. When 9-11 occurred, was the EAS actually activated? I do not remember, yet hard to miss the national emergency, when every TV network had a camera aimed at the WTC in NYC when the 2nd aircraft hit. That’s why it didn’t go off on 9/11, after it happened it was already being covered by the media, even cable stations that don’t have news either ceased programming and simulcasted a sister news channel or ran a ticker. It also helped that it happened at 8:30am ET when the big 3 were running morning shows in most time zones while the west coast already started their early morning local news. At first they thought it was an accident, once the second plane hit they knew it was intentional and grounded all air traffic, by then the coverage was already going. Outside of NYC and DC, no one else in the country really needed to do anything immediately so all the EAS would do was replace live coverage with a text message. The Presidential alert is a worst case scenario thing and would only be used for things like an imminent nuclear attack where everyone needs to seek shelter immediately if they have no idea where they are heading. Plus if NYC, LA, Chicago and DC were under attack, chances are the network’s main news bureaus will be unavailable for live coverage and it will be sometime before they can setup rolling coverage from a remote studio if bridges are destroyed, highways are blocked, and internet and telephone communications are crippled. Scott, to be honest I think you’re missing the point. But IMHO the failure of the daisy-chain relay system is a side story. The general public is conditioned to react when they hear the data bursts and the 1050Hz alert tone. This is a good thing — PROVIDED there actually is an emergency. Last Friday, thousands of listeners were alerted to pay attention to their radios, only to learn there was no event more serious than an unhappy announcer. Will some of them ignore the next alert? Probably. Even if the next alert is tied to a tornado, or a terrorist attack, or ??? In a consent decree entered with a Kentucky TV station last year, the Commission noted the material broadcast was a simulation of the EAS attention signal. It apparently didn’t, and couldn’t, trigger any boxes down the chain. What the material did do, was to cause viewers to pay attention to something that wasn’t an emergency by simulating an emergency. They “cried wolf”. If this were a violation of one of the FCC’s more obscure regulations, I’d have a lot more sympathy. Some of the recent forfeitures over issues-programs lists at non-commercial stations, for example, seem rather exaggerated. I can see how someone might not realize such things are necessary. I fail to see how anyone could think a false distress call could be acceptable. But let’s give people the benefit of the doubt and presume there’s someone out there who doesn’t know not to air a recording of EAS bursts. The Commission has issued multiple Public Notices detailing previous violations and making it clear such things are not acceptable. (heck, the only Public Notice I’ve ever seen issued in color was on this topic..) They have issued eye-popping forfeitures. Surely there’s no excuse for thinking this was OK? I’ve heard suggestions licenses should be yanked over this incident. This doesn’t rise to that level. A significant fine, however, seems in order. A look at Bones’ affiliate list suggests a maximum per-act forfeiture for each iHeart station that carried this show would total a little more than $3 million. I think that’s just about right. Put the ineffective, unreliable, antiquated, unnecessary, financial burden for broadcasters, EAS out of its misery. It’s only purpose in the last 20 years is to be a revenue generator for the FCC via non-compliance fines. Shut it down before we have to spend MORE money and resources on another system that still doesn’t work. Using ELF or VLF for EAS is not viable. The bandwidth at those frequencies is so small it would take 30 minutes or more to transmit a basic messages.